When blueberries are in season and you've had your fill of eating them out of hand, try making this delicious homemade Blueberry Sauce. It's full of blueberries in a thick bluish purple sauce, and its tangy sweet flavor makes it an excellent accompaniment to pancakes, waffles, crepes, ice cream, stirred into plain yogurt, spread on your morning toast, or even as a filling or topping for cakes. 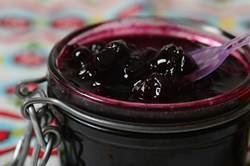 Since this Blueberry Sauce can be made with either fresh or frozen blueberries it's a recipe that can be made year round. It's easy to make and I like how it can be stored in the refrigerator for about a week. If using fresh blueberries check the underside of the container for any wet spots or staining. Discard any soft, moldy, or crushed berries and remove any stems. The blueberries are cooked with water, salt, sugar (sweetens the fruit plus acts as a thickener), plus cornstarch (cornflour) which also helps to thicken the sauce. For flavoring I've added a little ground cinnamon and vanilla extract although you can leave them out. When cooking the sauce there are a few factors that affect cooking time - your pot, the temperature setting, and how thick you want the sauce to be. If you like your sauce to be a little runny, it will need a shorter cooking time than if you want a really thick sauce. Once cooked a little lemon juice is added, which helps with thickening the sauce plus it perks up the flavor of the blueberries. The finished sauce does contain some whole blueberries, so if you want a smoother sauce, simply blend or process the sauce until smooth. Blueberries belong to the genus Vaccinium and are related to the bilberry, cranberry, huckleberry, hurtleberry, saskatoon, and whortleberry. This round, smooth-skinned, dark blue, sweet and juicy berry with a dusty white bloom, is native to North America and has been cultivated commercially since the early 1900's. The cultivated blueberries are up to four times as large as the wild blueberries and are available from late May to late September. Most of the blueberries sold in grocery stores are cultivated. When choosing blueberries look for firm, plump, fragrant, dark blue berries with a dusty white bloom. The white bloom is the blueberry's natural protection against the sun and is a sign of freshness. Remove from heat and stir in the vanilla extract, if using, and the lemon zest and juice. Taste and add more lemon juice if needed. Let cool and then cover and refrigerate for up to a week. Makes about 3 cups (720 ml). Preparation time 15 minutes.